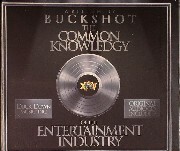 “The Common Knowledgy of the Entertainment Industry” is an 80 page book divided into three parts. The first part consists of the basics of the entertainment industry, 2nd consists of the framework, and the third part ties it all in with, “how it all works”. If you’re a hip-hop head hoping to start your own independent label one day, this should be the perfect book to gain a refreshing perspective of how it all works, from the bottom to the top. The fact that it also comes with a 15 track CD, and Q&A… you’re definitely getting more than your money’s worth! I won’t be passing that up. 02. "What Is Street Team?" 03. "What Is A Producer?" 04. "What Is An Executive?" 06. "What Is A Retail Rep?" 07. "How Do I Make A Record?" 08. "What Is A Road Manager?" 09. "How Do Record Label's Function?" 10. "How Do I Become An Artist?" 11. "How Do I Get My Record To A DJ?" 12. "What Is A CEO?" 13. "How Do I Get My Beats To MCs?" 14. "How Do I Sell At Digital Retail?" 15. "What Is A Marketing Campaign?"